Last Girl Lied To releases tomorrow, and I am so excited to have author L.E. Flynn on the blog in celebration today! If your a fan of Kara Thomas’ psychological thrillers, you are going to want to add Last Girl Lied To to your TBR! Dark, surprising, obsessive, complicated, and unrelenting. Your debut Firsts is a contemporary romance while Last Girl Lied To is a psychological thriller. What inspired the switch and how was the drafting process different? That’s a great question! I didn’t set out consciously to make the switch. I’m a firm believer in writing the story you’re passionate about, and Last Girl Lied To was that story for me at that time. The drafting process was the same at first—I’m a very fast first drafter and I don’t plot at all. I go into a first draft with just the hook and a sense of the characters. But… while Firsts came together quickly, Last Girl Lied To was rewritten and pieced together differently. It required a lot of attention due to the dual timelines and multiple twists. It was a very intensive writing experience, and it taught me a lot. Last Girl Lied To is told through alternating chapters between the past and present. How did you go about writing the story this way? The first draft of the story I wrote was told solely in the present, and I realized that just wasn’t working at all. I then went back and rewrote it with dual timelines. I mainly wrote in order—I feared that the flow wouldn’t feel cohesive otherwise. But in revision, I played around with the scenes—cut some, added some. I listened to the “American Beauty” soundtrack while writing, because I found songs with words too distracting! 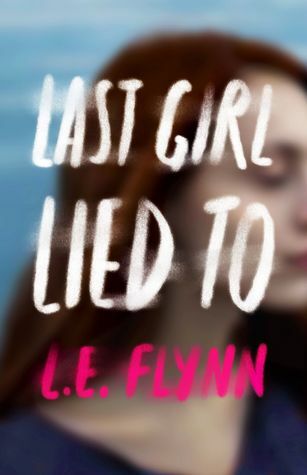 What psychological thrillers do you recommend your readers check out after they finish Last Girl Lied To and want more from the genre? Ooh, love this question! There are SO many excellent ones out there. I’m a huge fan of Kara Thomas—her latest, The Cheerleaders, is chilling in the best possible ways. I also adore anything by Kim Savage or Mindy McGinnis. (Female of the Species, especially, is brutal and jarring and incredible.) And while it won’t be out until 2020, I was able to read Hannah Capin’s Foul Is Fair early, and let me tell you… wow. Add it to your TBR if you love dark, feminist thrillers. What’s up next? Are you writing another thriller? I am! I don’t think I’ll ever not be writing a thriller. I feel like I’ve found my happy place with them. (I’m not sure what that says about me, ha!) Look out for my next book with Imprint/Macmillan to come out in 2020… I’m hoping to be able to share more details soon. For now, I’ll say that it has an extremely polarizing female protagonist, and that something terrible happens one day in the woods. Hopefully the twists and turns will keep you guessing until the very end. I’m so excited for LAST GIRL LIED TO! Thanks for this great interview and for the chance to win!